Over the weekend, I received a “Notice of Violation” for one of our club aircraft from the City of Santa Monica. It reminded me that we need to continue to (re-)educate pilots on the topics of noise, noise abatement procedures, curfews, and other related topics that are very important when flying in the LA Basin and many other areas. Almost every airport that is located in an urban area or has housing near the airport is likely to have some sort of noise abatement procedure and/or some sort of flight operation curfew or restriction. The degree to which these restrictions and procedures are enforced seems to be directly related to the cost of the real estate nearby. It’s not always easy to find out the details of noise abatement procedures before you go to an airport. In some cases, all you get is “Noise abatement procedures in effect, ctc arpt manager for details.” (this is the verbatim text from the AFD/Chart Supplement/AirNav for our home airport, EMT). Even a google for “EMT Noise Abatement Procedure” doesn’t immediately get you a good link. A little digging eventually finds me the LA County web site with some information. At EMT (San Gabriel Valley Airport, formerly El Monte Airport), I wouldn’t say that pilots are conscientious about adhering to the noise abatement procedure and I rarely hear any complaints or admonitions from the tower nor have I heard of any repercussions to pilots who fail to heed the procedure. There is no sign at EMT to alert pilots to the noise abatement procedures (there’s a poster in the pilots lounge), but there is a sign that advises no pattern practice between 8PM and 8AM [I’ll also note that the County web site lists different times for no pattern practice than is noted on the sign at the airport]. So, some pilots may erroneously think noise isn’t a big deal from their experience at EMT. - no touch/go, stop/go, or low apch permitted on sat, sun, hols; weekdays ss-0700. - if dep north, no right turns bfr rchg shoreline. 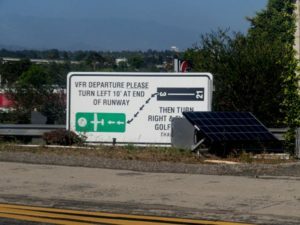 rwy 03 dep no turns prior to 405 freeway lctd 1 mi east. - engine maintenance runup: jets and turboprop north side, within 300 ft east of twy a3. piston single and twins on south side, within 300 ft east of twy b3. - cons noise ordinance in efct ctc noise office for procs (310) 458-8692. -noise lmts all acft: pure jet and stage ii (with/without hushkits) prohibited. max moise limit 95.0 dba sngl event noise exposure level (senel) rcrdd 1500 ft extdd cntrln. - curfew: no eng starts, apu, or tkofs exc ppr lifeguard flts 2300-0700 mon-fri and 2300-0800 wkends. - noise readings on 122.85 nml ofc hrs. - hel flt trng opn prohibited; hel opns apch arpt bdry at midfield at or above 900 ft msl. - ry 03/21 dep end approx 220 ft fm residential homes. extended high power settings on run-up or dep negatively impact the community. I’ve highlighted the particular one for which we received a violation. This violation was a warning, but a repeat could result in fines and possible actions against a pilot, so they must be taken seriously. Santa Monica does document a lot of these with a variety of signs at the airport too. In general, violations are sent to the registered owner of an aircraft. This can sometimes take weeks or months. AACIT asks that all pilots become familiar with the noise abatement procedures at the airports where they operate and comply with all procedures, as long as that can be done in a safe manner; curfews should be strictly adhered to. If you have questions about procedures, ask a tower controller or ask your CFI or a board member.